Let everyone list there exhaust set ups, and what they think about them. sound? power gains? look? also, opinions on best full exhausts and/or mix and match set ups. 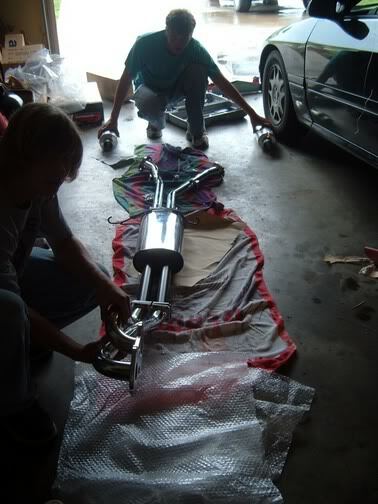 ex: RB header,Bonez high flow cat, corksport 3" catback. Also....Price for set ups and where to find these would be helpful to all us rotor heads. I made my own. RB header with my homemade collector, three inch to the magnaflow, small resonator, and three in to the axle. ITs loud, its annouying, but it works. I have the Racing Beat true dual header, presliencer, and y-pipe and then bought some ebay mufflers for like a 100 bucks for both. The pipe between the y-pipe i had done at a local shop so its not that great of quality but i had ran out of funds for good stuff. The sound is not too bad except when you hit about 3,100 rpms the tone is just at the right pitch to be annoying but otherwise i love it. Power gains im not sure becuase i don't really remember what it was like before i added it. I could be wrong but i think the price ended up being around 800 or so. haha yes but RB has done research in their product and i do not have the best access to things to do a lot of my own stuff. True, when I get mine on the dyno soon I will let you guys know how it does. Yeah, im interested. What do you expect out of it, any ideas? RB Header, eliminated the main cat with a test pipe, and a Borla Cat-Back system. Around $800 for everything. test pipe? what do you mean? and what kinda power gain did you see?